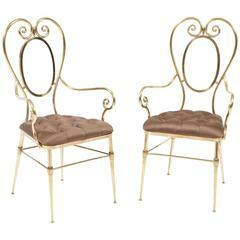 Decorative pair of brass side chairs, Italy, circa 1950. Upholstery in silk fabric, diamond tufting. Measures: Seat height is 18 inches. Reproduction of a Swedish 1950s club chair. Very comfortable. ultra leather(faux leather), 100 colors, washable, very durable. 5 weeks. Priced at 2450.00. A very comfortable chair by Yngve Ekström, Sweden, circa 1960. 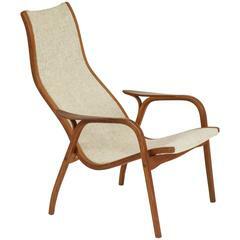 Chair frame is made of teakwood and upholstery fabric is nubby cream wool. 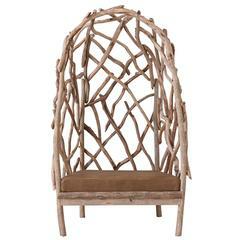 Bergère chair Robinson made with driftwood and old planks with turtle dove calf seat. 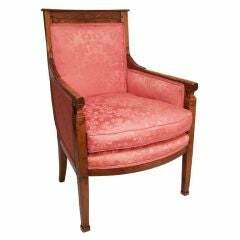 Rectangular molded and reeded frame, all newly caned, down swept arms with lotus leaf carved ends supported on reeded supports, raised on reeded tapered legs and casters. 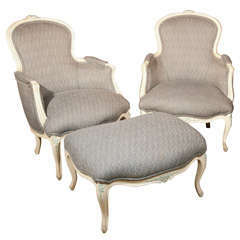 French Louis XVI style duchesse brisee set, circa 1940s, pair of crème peinte bergere chairs accompany a foot stool of the same taste. Stool: 18, 27, 23. 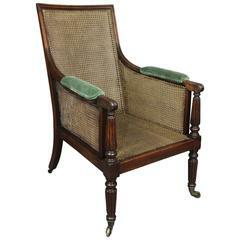 Neoclassical style walnut armchair with carved detail. Beautiful rich patina on the wood. 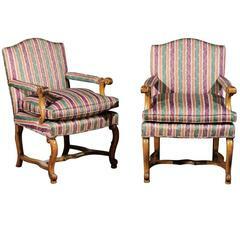 Upholstery is in good condition..... France, late 18th century.